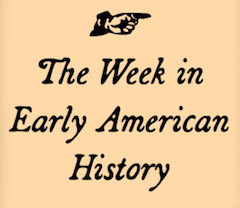 Welcome to your weekly roundup of early American history headlines. Now that you’ve aced your presidential history knowledge, and reviewed this reading list of their lives, it’s on to the links! On a more serious note, Matthew Pratt Guterl discussed “the academic writing thing” in light of Nicholas Kristof’s recent comments in The New York Times on professors and prose. Two neighbors, the College of William & Mary and The Colonial Williamsburg Foundation, announced plans to explore a joint MOOC (massive online open course) venture focusing on “the relevance of the American Revolution.” Heartiest congratulations go to Andrew Jackson O’Shaughnessy, Jeffrey L. Pasley, and Alan Taylor, the three scholars named as finalists for the George Washington Book Prize. Google invited researchers to take a stroll through John Rocque’s 1746 London map, and also relaunched the searchable News Archive. Trinity College Dublin opened up a cache of 10,000 significant maps (c. 1650-1800) for digital access. Something to sing about: The Library of Congress has debuted “Songs of America,” an interactive database of 80,000 online items’ worth of recordings, biographies, timelines, and maps that present a history of America in music. Finally, in colonial real estate news, this historic 400-acre Virginia plantation can be yours . . . for just under $15 million.